and crankiness of the former. when we are all grown. sideways, with music running through her veins. It’s nice to see that she hasn’t outgrown sugar spun confections either. our bakies, but different too, like us. cake you know that it’s more than just cute. more than 6 years, I’ve finally updated its look and feel! I am still in the process of cleaning up (odd links, a more detailed About Me page, and so forth) but so far I love it! comforted and new things that make us giddy! Cheers! Congratulations on the new look. Love it! Love the look of the blog. Very pretty. And yes growing up can happen way too fast! I love the new look Joey. And that is beautiful cake too. I love your new look and banner! That cake looks lovely. Hi Chef D! Thank you! Hi Heidi! It was past about time! Thank you!! Love the Pink cake, love the post & really love the blog's new look! Congratulations! Thanks for sharing all these lovely things! “getting plain ole awesome!” now there's a great reason for another birthday! Actually so is your cake from the looks of it. Really a neat idea for the color intensity effect, you did well. What a delicate and beautiful looking cake. 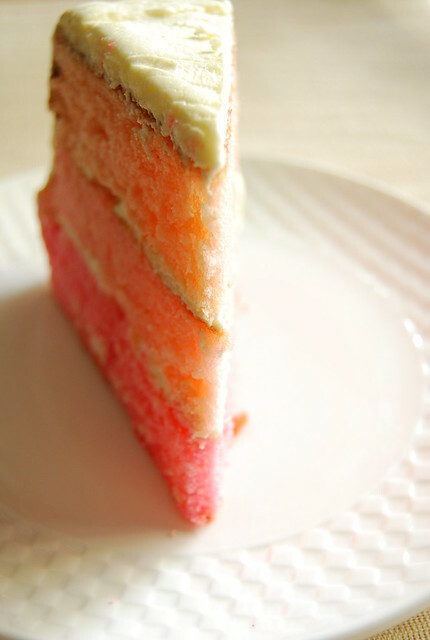 Love the layer cake…pink is such a great colour..it is always so celebratory in my opinion! Oh the new site looks excellent! and the cake? I want a slice, please. Love the new look!! And the cake looks just delicious! I've been running into K recently – her cygnet (she can explain that one) and Little A go to the same preschool! wow, the new layout is amazing! congrats, joey! Hi Tanna! I look forward to birthday for that reason – another year is ALWAYS a reason to celebrate in my book 🙂 I have seen some cakes on the net with this effect and have been wanting to try it…I think it I’ll look even better with more shades and layers! Hi Brittany! I love pink and I am not ashamed to say it! 🙂 Thanks for your nice comment! Hi Millet! So glad you think so! Thanks! What a cute cake! I love the different shades of pink! Thanks Melanie 🙂 I'm loving the pink too!